That’s what Millennials want out of brands in a Circular Economy. At our Medinge Spring Event in Seville, Spain, we discussed Brands’ search for Meaning. In the Action Labs at the event we deep dived into the question: how can we develop a great 360° economy? More specifically: can brands accelerate the transition towards a circular economy? And if so, how? Teaming up with Ignacio Fernández de Bobadilla Hastings -responsible for innovation at Loyola University Andalusia, on Day 1 we listened to a group of Millennials. On Day 2 we mirrored the Millennials’ insights to a more experienced group: a mix of business leaders and brand consultants. We were surprised that the concept of Circular Business was far more difficult to grasp for the more experienced group. This may be explained by their highly trained innovation-muscle – they are creative leaders, constantly scanning the world for opportunities and ways to add value. Stretching their minds for new business concepts, they emerge from a customer’s point of view. Not necessarily fed by the idea of a linear make-taste-waste economy or a Circular Economy in where resources loops are being slowed down, narrowed down or closed . Economy in which stakeholders collaborate in order to maximise the value of products and materials, and as such contribute to minimising the depletion of natural resources and create positive societal and environmental impact. Generally, the first line of thinking in a Circular Economy is about tangible and traceable value. Branding on the other hand is a component that adds intangible value. It is about vision and values. A way to bring people together. I kept that in mind while moderating the debate in these two Action Labs, by tapping into the current circular economy knowledge of each group as professionals and their actual shopping behaviour as individuals. The Professionals are eager to learn more conceptually. They asked for the specific drivers for this transition. They challenged the concept: how new is this line of thinking for brands that are already in sync with their stakeholders? We talked about the disruptive power of circular concepts; what if e.g. Fiat designs a car from which the parts can easily be harvested? Will their source of business change? Will that make them more agile? Is this a key priority for a car manufacturer in a world where we are heading towards self-driving cars and completely new mobility concepts? Or is Fiat preparing for a Circular Economy: anticipating for a product-to-service business model innovation: by designing fully re-usable automotive parts and maintaining the ownership of valuable resources? It is an interesting debate, but I doubt if these executives will change their business behaviour, despite the fact that there are plenty of reasons to speed up the acceleration of Circular Business. (That is why in our day-to-day business experience we challenge our clients to deal with change and uncertainties by following a strategy of small business experiments. But that’s a topic for a follow up Action Lab). In a world of fast fashion: is it credible for H&M to collect worn clothes and reward you with a discount on your next buy? In a world of luxury brands: is it attractive for Nespresso to collect used cups of coffee from customers as part of a reversed logistics programme, while they are carefully shaping a refined customer experience? In a world of fast moving technology subscriptions: is promoting a new phone every year a smart way to campaign for Vodafone? As a great way to support guilt-free consumption, while at the same time closing resources loops by reselling and re-using these more or less ‘low mileage’ phones. 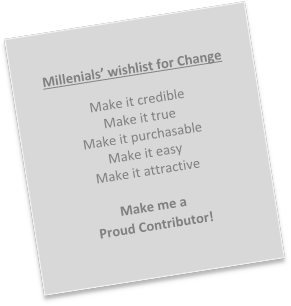 The Millennials share what matters to them. “It may not be easy changing business in a more sustainable way…” they say. “But it needs to be done anyway.”. They state. So, instead of focussing on the things that are complex to change, they suggest to focus on the things that need to be done. They gave we a tiny wishlist for Brands with a Conscience. Easy to understand and at the same time very delicate wishlist. I keep it under my pillow. As a small lucky charm. Reminding me everyday that brands can be vectors of change.